HOPA members are hematology and oncology pharmacists, most employed by hospitals and health systems. 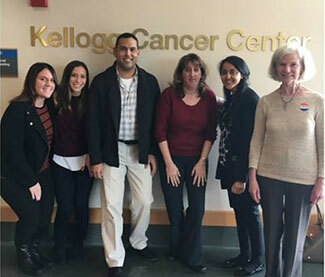 These individuals work closely with physicians and patients to administer live-saving cancer drugs, offer counseling, and provide a high level of compassion to patients. Unlike pharmacists working retail and dispensing prescriptions, the public is not always aware of the important role HOPA members play in the care delivery of cancer patients. A staff discussion was the impetus for soliciting a member visit. Visiting a member during his work day provided insights on what members do every day, their challenges, and opportunities for the association to further meet their needs. The HOPA staff visited a former board member heading the oncology pharmacy at a leading health care institution. We made sure the time of the visit was a convenient for him and shared some of our goals for the few hours we spent with him and his team. Attendance: While not everyone from the staff needed to be present, we wanted representation from membership, education, sponsorship, and operations to attend. This allowed us to institutionalize the knowledge gained in all areas of the organization. Identify the right member: We didn’t just select a member at random. The association needs to know the triumphs and struggles of members working in budget-strapped places as well as those in state-of-the-art institutions. In our case, we thought this particular member was the ideal person to provide staff with a primer and discuss his history with the organization. Ideally, you can conduct multiple visits with your staff and appreciate different settings, circumstances, and perspectives from among your membership. Set objectives: Setting objectives for the day is an important way to ensure this isn’t just a field trip that will soon be forgotten. Both staff and the member need to have a productive time. HOPA staff wanted to obtain further information on how the pharmacy interacts with other areas of the cancer center. During our visit we also had discussions with physicians and nurses about the integral part pharmacists play in the care team. Debrief: Once back in the office, offer folks a time to discuss their experience with the rest of the team. We scheduled a team meeting and allocated some time to discuss our experience and how our gained knowledge can influence our work on behalf of the members. HOPA staff had the opportunity to see up close, for the first time, the work of hematology/oncology pharmacists. We toured the facilities from patient treatment rooms to the chemo mixing lab and learned about the various roles of each member of the patient care team. This unique experience of spending time “on the job” with an association member not only improved our understanding of member needs, it will help us create offerings and opportunities that better serve all our members going forward.